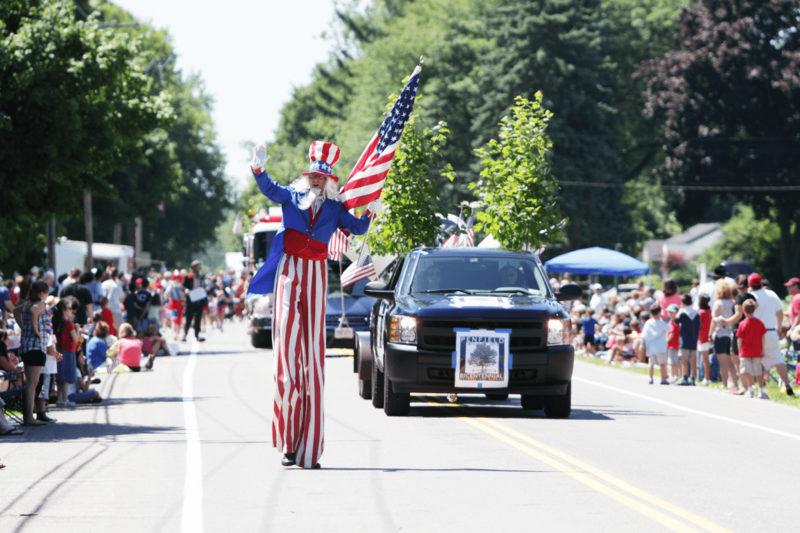 Parades are a very significant part of Fourth of July celebrations, as well as a great opportunity for advertising – did you know that some 30 million Americans attend these parades every year? As businesses of all types flock to parades every July to publicly promote themselves, this creates a unique and lucrative opportunity for personalization shops to create custom promotional products for these businesses to give out to potential customers. 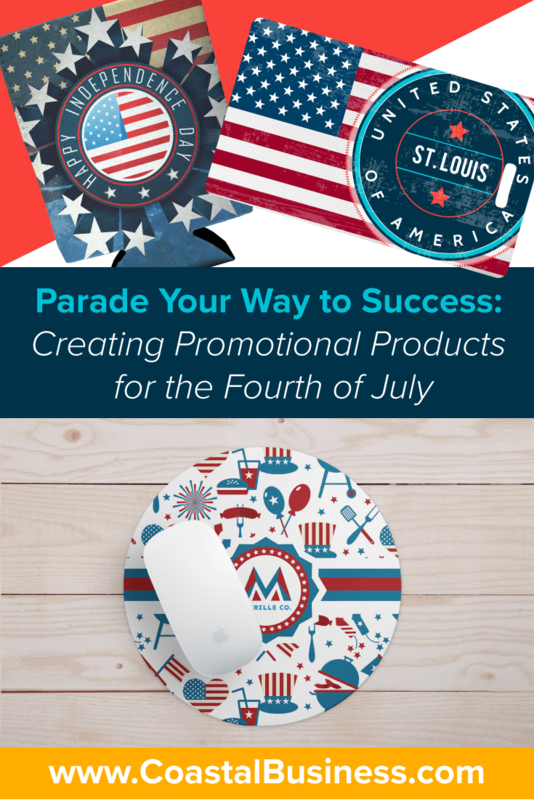 In this post, we’ll go over how you can create and market your promotional products to parade your way to success this Fourth of July. Custom promotional products are always in demand. On Google, the term “promotional products” is searched over 400,000 times every year, and the demand grows especially high during holidays such as St. Patrick’s Day, Fourth of July and Christmas. Businesses that attend Fourth of July parades will hand out branded, patriotic-themed promotional products bearing their company name or logo – T-shirts, beverage insulators, refrigerator magnets, keychains, and more. Why do they give this stuff out for free? Because folks love freebies – especially when the item is something they find useful. When businesses hand out fun or exciting functional products showcasing their brand (like T-shirts or can coolies), the recipients effectively become walking billboards – which helps the company reach a wider audience and creates additional brand awareness! Think about creatively branded mousepads. First off, they are practical – most people who work in office settings still use mousepads regularly. As they sit at their desk for eight or more hours a day, that business’s logo is on display in front of them, keeping the company and their services top of mind for the employee and their coworkers who walk by. That’s easy, long-term brand exposure. So, you can see how a business would value useful and clever promotional products, just as the recipients of them do. 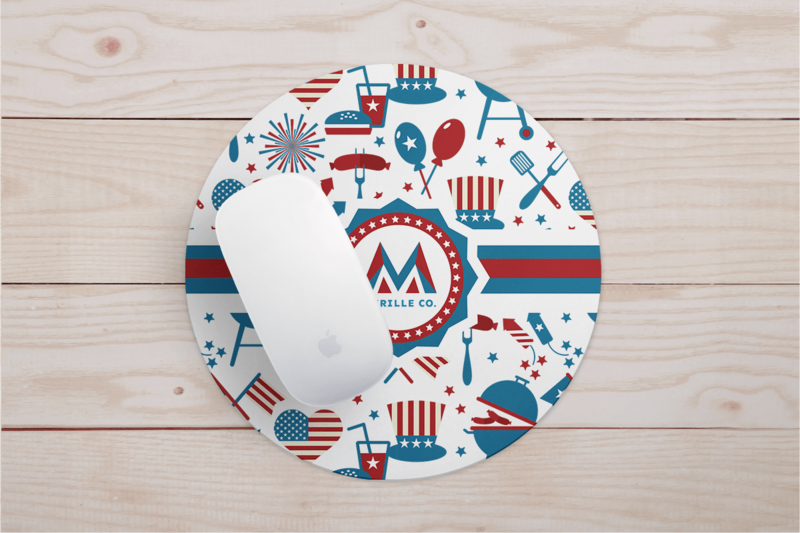 Here’s where you and your shop come in – creating and providing companies with distinctive, customized promotional products on the Fourth of July for publicity’s sake. But – before you fire up the heat press, let’s look at three tips to creating promotional products that will genuinely leave sparks flying with your customers and their clients this July. Personalize something useful. Don’t give away or advise giving away trinkets and items people won’t use. There isn’t much point in putting branding on a product that gets tossed after the parade ends. Be conscientious of who your customers are (or your customer’s clients) and what they find useful. Take trends and timeliness into consideration. It’s 2018, so items such as branded paper weights, letter openers and cheap pens might not be the best choice. Choose or suggest products relevant to the brand. Does your customer make craft beer? Perfect! Recommend branding coolies or bottle openers. Are they in the travel industry? Great! 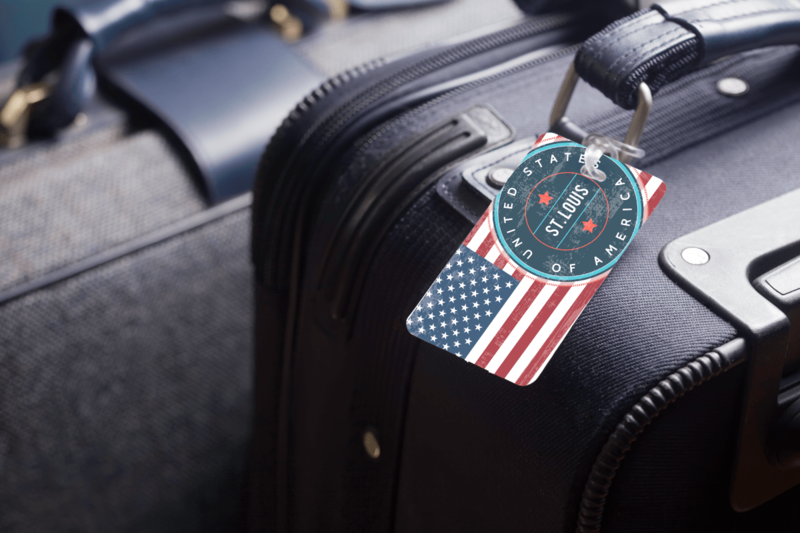 Offer to make personalized luggage tags. Include a patriotic theme. Since we’re talking about Independence Day, get creative and add a few stars and stripes, some red and blue, and other simple designs that are relevant to the holiday. Have fun with your projects! With all of this in mind, start marketing your personalization business in advance and remind local companies to choose you as their supplier of promotional products. Do some quick research and find out which organizations will be attending the parades before reaching out to them, in addition to contacting your current customers. Local government websites and chamber of commerce business networks are great tools, as they usually post the vendors that take part in upcoming events. You can also try advertising on other avenues like social media. Facebook, Instagram and LinkedIn all offer exceptional targeting capabilities and give you the ability to zero in on specific geographic regions, demographics, industries and interests. So, if you only want to serve customers locally who will be at your parade, just send ads promoting your business to those who live in that region! 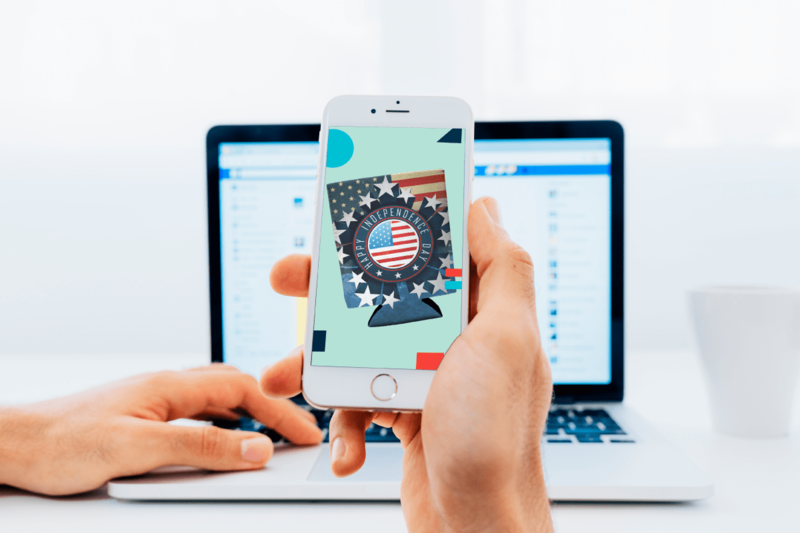 One very effective approach to driving business from current and prospective customers around July 4th is to create and pitch them product mockups or project proposals in advance. This will do a couple helpful things when it comes to strengthening your relationships with your clients (both old and new). For those that have never worked with you before, a gesture like this will give potential customers insight into what kinds of products you can personalize for them and what they may look like. It’s a good opportunity to show off your design skills and capabilities as well! Consider adding their brand/logo and a patriotic graphic or clever saying to a few promotional products you carry. In some great cases, the customer may reply, “Wow, those look great, thanks for thinking of me, I’ll take 20!” and buy them as-is. Boom! You’ve not only showed off your ability to create great products, but you’ve also shown the customer you truly care about their business and its success. 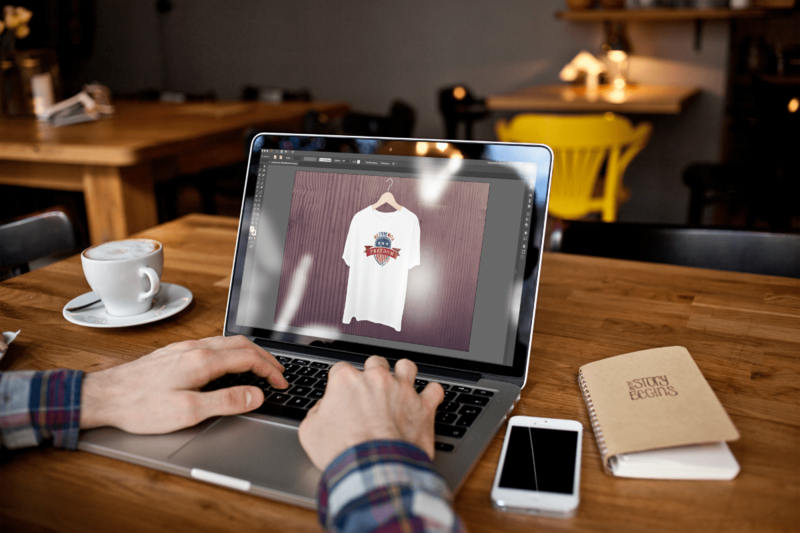 In other cases, a pitched mockup accompanied by a friendly email may be all that is needed to spark a new idea in the customer’s head that could also lead to a sale. Either way, you’re going the extra mile for the customer by cutting out a couple steps in the ordering process and reducing some of the mental burden on the customer’s end, making it easier for them to buy from you. This may take some extra time and creative thinking, but the time and care investment required is worth it. If a customer decides to pass on your proposal, don’t take it personally – remember you can re-use these mockups with each one of your potential customers now, and even in future years (for different customers) to make the most of your work! Most of this article focused on strategies behind how your business can provide promotional products for other businesses, but let’s turn it around and think about how YOU can apply these ideas to your own shop! Consider attending or even being in the parades! Having your own business participate in a local Fourth of July parade or community event and handing out products that promote your business is easy, cost-effective and a great way to gain some exposure. Think about it – you already have the equipment and materials to create promotional items for other businesses, so why not do it for your own? No worries if you aren’t interested in creating a float for a parade (we know those can get expensive and you may not have the staff to support the idea). Simply walking in a parade or setting up a booth and handing out free swag bags while talking to folks and creating relationships can go miles for your brand.